How can a family save their farm in the face of urban development, while raising children close to nature and keeping a sense of community in the face modern life? Potomac Vegetable Farms East, the only remaining vegetable farm in Fairfax County, VA, lives in a cooperative space with the Blueberry Hill, a co-housing community where children grow up as if on a farm. Yet a rapid transit line to Dulles airport is due to open this summer and will pass very close to the farm. In the midst of the traffic jams of Tysons Corner, VA, the Newcomb family saved its farm by sharing space with a group of 19 homes on 7 acres. Potomac Vegetable Farms sells at the farm stand on the heavily-traveled Leesburg Pike, and another one 35 miles west in Purcellville, Va.
Potomac Vegetable farm-stand is open from July – October Other sales are through community support agriculture. The Newcomb family began farming in 1960. Hiu and Tony purchased the current property around 1970, after they moved to Fairfax County from DuPont Circle in Washington. The idea for the current farm and its surrounding community began more than two decades ago. Daughter Hana had returned to the farm after graduating from college in 1980. Tony had died in 1984. Hana and her sister, Anna Bradford, wanted to remain on the land and raise families there. They held meetings with like-minded people, researched options and started the regulatory approval process for a co-housing community. By the mid-1990s, plans were going forward and residents began moving into the homes at the end of 2000. Fortunately, county zoning allowed for the land to be apportioned between agricultural and residential usage. There’s no financial entanglement between the housing and farm communities. The residents of Blueberry Hill own their homes, but share a communal area. Lots of woods surround both houses and farm. More recently, a neighboring peach orchard, Moutoux Orchard, sold to a developer and re-located. A new development sits between two farm properties that constitute Potomac Vegetable Farms East. Hiu Newcomb points out a type of corn used for popcorn. School children are amongst her favorite visitors. 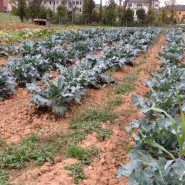 Of the 25 acres Potomac Vegetable Farms owns in Fairfax County, seven acres surrounding the housing community are farmed. Potomac Vegetable Farms (PVF) owns another 180 acres 35 miles west in Loudoun County, where Ellen Polishuk oversees the management. The western farm has seven full-time employees, with only 9 acres taken up by crops at one time. PVF grows 32 different vegetables and flowers on both farms, and regularly rotates crops throughout the season. Hiu Newcomb and daughter Hana Newcomb are partners with Ellen Polishuk who began working at the farm as a teen 30+ years ago. Another daughter, a veterinarian, doesn’t live at either farm, but spends part of her time raising the chickens in and around Potomac Vegetable Farms East. 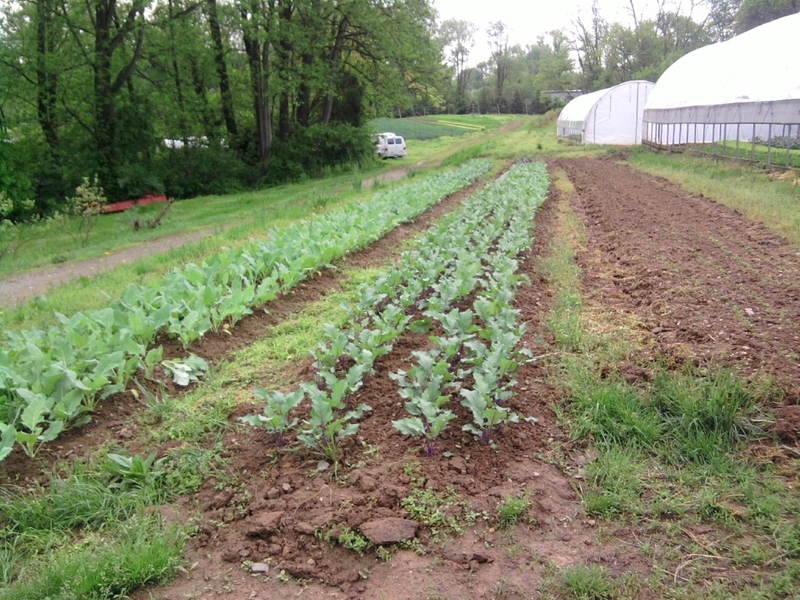 Potomac Vegetable Farms describes uses no herbicides or chemical fertilizers. The farm was certified organic in 1991, but the owners avoid the paperwork for organic certification and simply call their methods ecoganic. The organic processes haven’t changed. It is important to the family to avoid anything chemical; they feel that when the father, Tony, died of lymphoma, herbicides had been the cause. 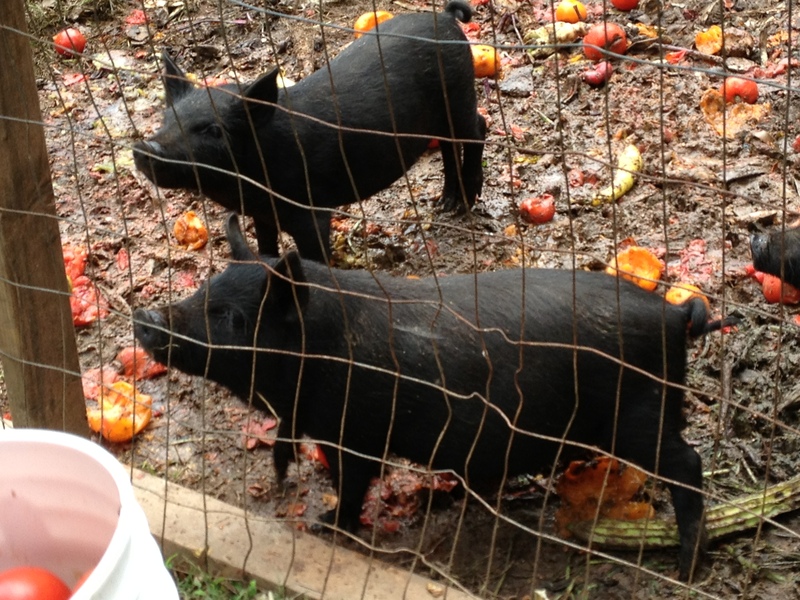 According to Hiu Newcomb, the farm has perfected high-tech composting methods, using hay and farm waste as fertilizer. At the time of a visit, three little pigs from another farm were making their home at PVF East, eating unused vegetables and reducing the waste. The rest of the farm scraps will become part of the compost. The two stands and Washington area farmers’ markets bring in 50% of the farm income. The other 50% of income comes from PVF’s two buying clubs of 550 customers. Hana Newcomb started the buying club 13 years ago, before Community Supported Agriculture (CSA) became common. 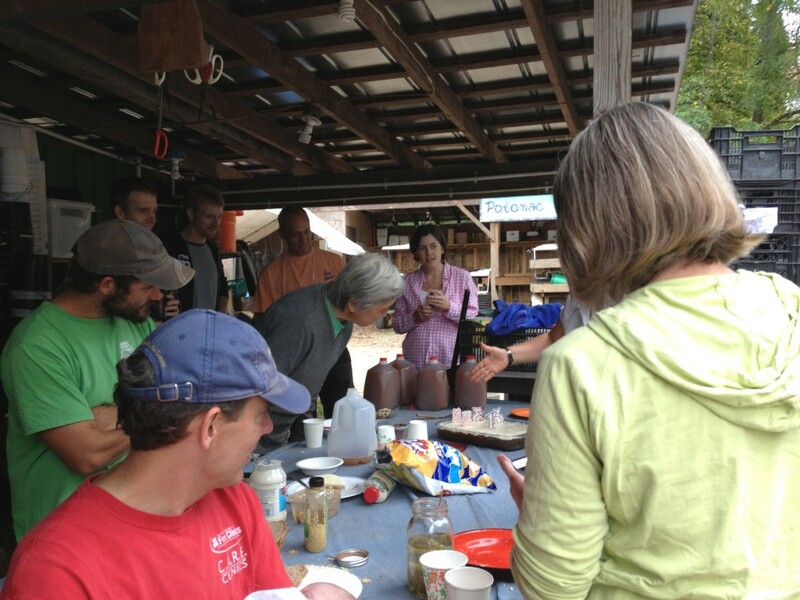 Community Supported Agriculture guarantees freshness and takes the middlemen out of food chain. 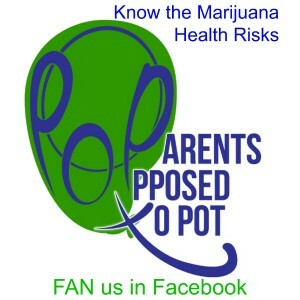 Those who participate pay ahead and buy a portion of the crop each season. For PVF East, they can take weekly deliveries at one of about 16 locations spread throughout Fairfax County, Arlington and Alexandria. It’s a little cheaper for those who pick up at the stand. 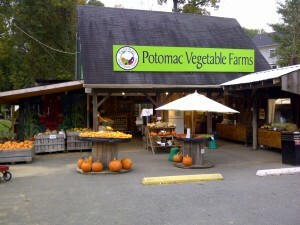 Members of PVF West can pick up at the farm, the farm stand or the Leesburg Farmers’ market. The CSAs, or buying clubs, have fall and summer farm shares of various sizes. There are added options for eggs, bread, flowers and/or chicken, possibly with a discount those who have a hard time affording it. CSA members count on a huge variety of surprises in the vegetables and the PVF has published a cookbook especially for them. If someone doesn’t like the closeness or doesn’t want to help or share, they wouldn’t stay long and probably wouldn’t buy in the community from the start. It’s not a commune, and it’s not libertarian, either. Decisions are made by group consensus. It’s recommended that adults contribute about 8 hours a month working for the community. The fronts of homes in Blueberry Hill face towards a common center, while cars are kept away from the common area. Among the buyers in Blueberry Hill were CSA members, farm-stand customers, and the architect who partially paid for the house with his services. To save the flattest areas for farming, architect Jack Wilbern built the homes on slopes with a central greenway running down the middle. As the name suggests, it’s a spot that once contained the farm’s blueberries. Children of Blueberry Hill grow up fairly close to the chickens, a few pigs sometimes and loads of vegetables. Most children go to the public schools. The community is hidden from the road, and, for the most part, it’s a well-kept secret. Co-housing communities are old-fashioned neighborhoods which solve some of today’s environmental and social problems. They bring together the value of private homes with the benefits of more sustainable living, some common facilities and good connections with neighbors. The movement began in Denmark in the 1980s and spread throughout Europe. The United States has about 130-150 co-housing communities, although most are not agricultural. 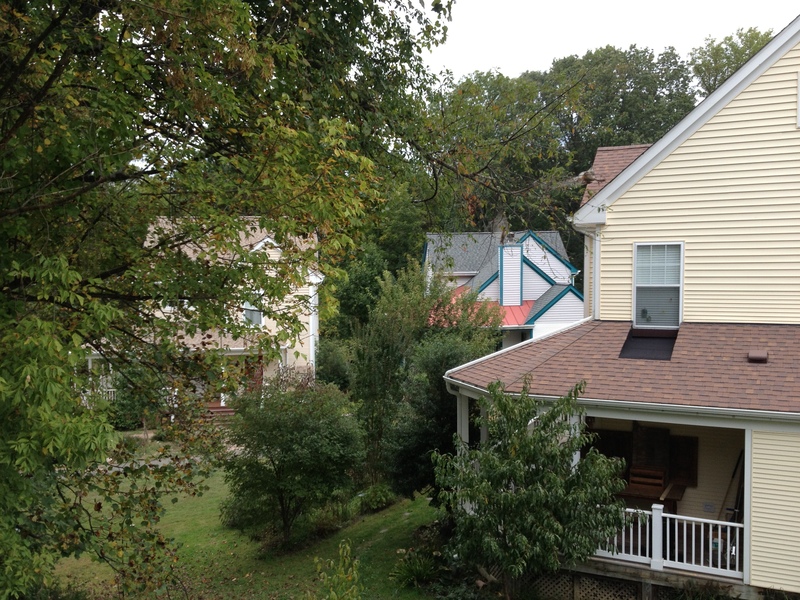 A co-housing organization’s website lists 10 in Virginia and about 40 in California. Most of the children enjoy participating and choose to be involved with the farming. It’s healthy physical activity, merging community and work life. By the time they become teenagers, they’re a stable crop of employees. From July through October, some teens from the community work by selling the fruits and vegetables at the farm-stands. 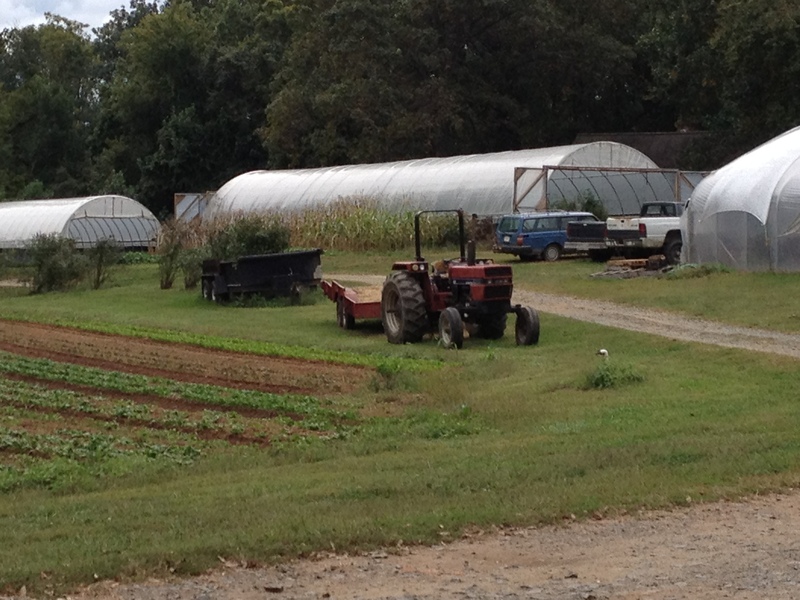 Ninety percent of the adult residents aren’t involved with the farm, and many work in Washington. Hiu Newcomb is 79 and continues to work, as she especially loves the vegetables which come in a great variety. 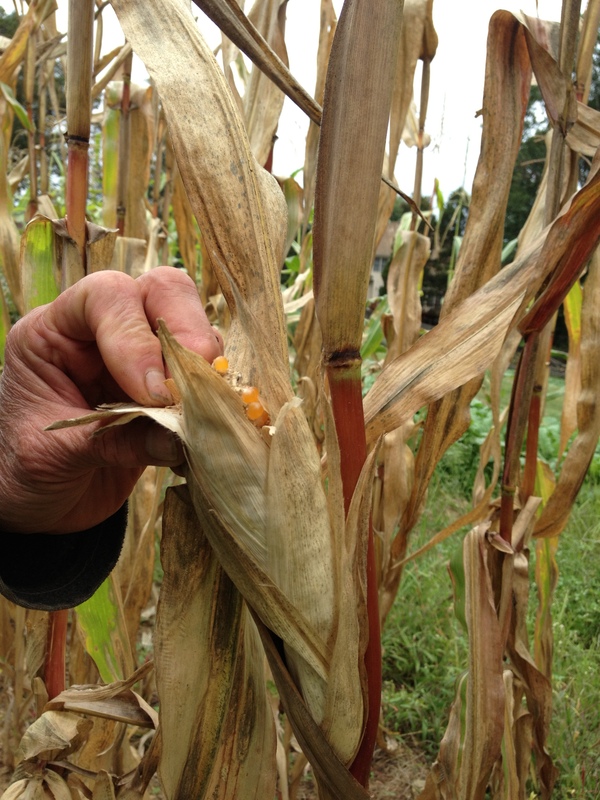 There are also flowers, fig trees, cotton plants and the type of corn that becomes popcorn. It’s a pleasure for her to give tours to children in school groups, introducing a much larger group of kids to the farm environment. It’s safest to buy meat from a farmer or buying club that only involves grass-fed animals. If you eat corn-fed beef, it can be assumed that the cows have been fed GMO corn because 88 percent of the US corn crop comes from genetically modified corn. As of now, the only fruits and vegetables which have been approved for genetic modification are zucchini, some yellow squash and papaya. American wheat and rice are not GMO.